Welcome to the NECA/IBEW Family Medical Care Plan! Using LiveHealth Online, you can have a private and secure video visit with a board-certified doctor 24/7 on your smartphone, tablet or computer with a webcam. It’s a quick and easy way to get the care you need when you need it — without any long wait times. A doctor can assess your condition, provide a treatment plan, and even send a prescription to your pharmacy, if needed. All you need is Internet access with a webcam or the LiveHealth Online app on your smartphone or tablet. It's that easy. Sign up for LiveHealth Online and register with your medical/Rx ID card to get access to a doctor on your schedule — when and where you need one. To learn how LiveHealth Online works, watch the video below or click here to learn how to register. Please note: This benefit only applies to members who have their medical benefits through one of the FMCP PPO Plans. You can access the Member Self-Service Online Portal by either clicking on 'Member Sign-In' under the 'Members Only' navigation tab or clicking on the button below. If you have not already, you will need to register using your medical/Rx ID or your Social Security number. WANT TO FIND AN IN-NETWORK PROVIDER? Members with a FMCP PPO Plan can click here to search for in-network providers via Anthem. how can you ensure that you’re making the best decisions for you? That’s where Best Doctors comes in. Did you know that, according to the Institute of Medicine, most people are likely to experience at least one diagnostic error in their lifetime? We understand that medical challenges can be stressful enough without having to worry about the accuracy of your diagnosis and the effectiveness of your treatment. That's why Best Doctors has several services to give you the help you need no matter your issue, and they’re free for you and your dependents. Expert Second Opinion – If you’re looking for a second opinion, you can have your medical case fully reviewed by one of the world’s Best Doctors via the InterConsultation Expert Second Opinion service. Reach out to Best Doctors, and you'll get a detailed report and a confidential recommendation about your diagnosis and/or treatment plan. Treatment Decision Support – Making the right decision about your conditions can be difficult when you don't fully understand the risks or tradeoffs of your treatment options. Treatment Decision Support provides access to a multitude of resources such as personalized, relevant clinical coaching and online education to help you better understand your condition and the appropriate treatment options for you. Ask the Expert – Get personalized answers to basic questions about a diagnosis or treatment options. Simply submit your questions to Best Doctors and quickly receive the right guidance from an expert physician. Find a Best Doctor – Need a pediatrician? Want the best surgeon in your area? Looking for a medical specialist? Based on your criteria, Best Doctors can help you locate the right in-network doctor in your area. They’ll even call to verify that the doctor is taking new patients. And because Best Doctors only selects the best physicians, you’ll be sure that you’re getting the best care for you. Critical Care – For critical situations or illnesses, call Best Doctors for help making the right decision at the right time. Why use Best Doctors? Because it’s easy, convenient, confidential, and free. Because peace-of-mind can be only a phone call away. And because you deserve the best care. Best Doctors is committed to helping you receive it. To learn more, contact Best Doctors at 1-800-497-1634 or https://members.bestdoctors.com. You can also view member testimony at http://bestdoctors.com/about-us/testimonials/. Please note: If your medical coverage is through Kaiser, this benefit is not applicable. This website is designed to provide educational information on the Family Medical Care Plan (FMCP). It is not individualized and is not intended to serve as the primary or sole basis for your entitlement to the Plan. This website cannot cover all of the details of the Plan; it is an overview. The Plan governs all questions concerning benefits, rights and responsibilities under the Plan. In the event of a conflict between the website and the Plan, the Plan will govern. There have been many changes to the Plan since it was established. Your benefits are generally based on the rules of the FMCP at the time you begin receiving these benefits. Therefore, before making any decision that could affect your rights or responsibilities under the Plan, you should contact the Benefit office and ask about how the Plan applies to your situation. ATTENTION: The Notice of Privacy Practices is available on our website. Please click Plan Documents, Plan Notices & Member Forms at the top of the page and select Plan Notices to find the notice under 2013 Notices. PLEASE NOTE: If you are planning to retire, please notify the Benefit Office at least 45 days in advance. This is critically important to continue your medical coverage. 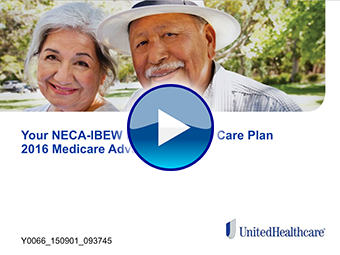 Click below and watch an 18 minute video to learn more about the UnitedHealthcare Medicare Advantage Plan now.